Ok! Here's another test. This time I adjusted the shadow angle, color, and opacity. The lights colors are sampled from the picture as @Triem23 said. Also the ambient light and model's diffuse reflectivity are reduced, making the AT-AT's front darker. @ZCC_Productions Good job making the changes. It's looking even better. Success! That looks spot on! The only critique anyone could have is the AT-AT is technically too small, but you've got it sitting correctly in the environment, you've got the lighting matched up, and the composite and animation are solid! I almost think you should duplicate the AT-AT, push the duplicate over in 3D space and scale it up to proper height. The big AT-AT is "Mom" and the small AT-AT is "Junior." Then it becomes a shot about a "child" being taught RR Crossing safety! @ZCC_Productions Wow! I am so jealous. I wouldn't even begin to attempt all the animating involved in making an AT AT walk, but you've got it down. Good work. @ZCC_Productions ; Awesome! Excellent work. @ZCC_Productions Love that shadow!!! Very nice job. Looks great and really sits in the scene convincingly. Only thing I really noticed is the motion of the 'left-right-forward' look when it paused is linear and would probably look better with smoother motion (even though the idea of moving the head to look is a weird concept anyway...look out of the side windows guys! ) Although if you're going to zoomorphise the AT-AT: convincing head movement will sell it better. Really pedantic point: would/should it pause with one leg up? I know the answer is: "Yes, if you don't want to have to animate it coming to a complete stop, then start up again! ", so...I wouldn't worry about that. @Palacono Well, of course the walker is a very silly idea, anyway. 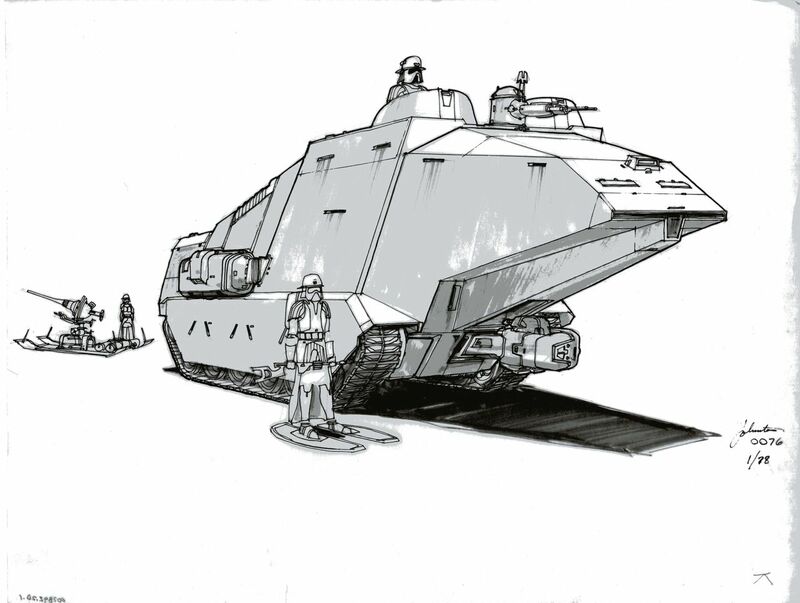 My old "Empire Strikes Back Sketchbook" had good ol' Joe Johnston's original designs, which were basically a standard tank. In-Universe (i.e. George Lucas's edict), the AT-AT has it's truly impractical shape because of a psychological warfare component. The AT-AT is supposed to be animalistic--hence silly things like a turning head, and, oh yeah, BEING A WALKER!. Found it! Also note the more "asian" influence on the Snowtrooper design. Vader and all the Empire military armor originally had a more "samurai" look to them. Vader kept most of his, while varied Troopers mostly became stylized skeletons. The poor guys in the head must get awful motion sickness... "Buckle up guys, I'm going to look to the left. Let's hope there are no cables below us because otherwise we're screwed". @Palacono I sorta see what you mean, but this shot isn't really meant to be 100% accurate and is just for fun. The AT-ATs are supposed to be like their own character. The head turning is set to smooth for now, but if I did a more serious fan-film I would spend more time adjusting the movement, scale, etc. I love it. "Mummy, are you sure it's safe to cross here? OK then...."
Smoother is much better. You could potentially jank on those bezier handles to make it slooooow down as it approaches the stop point at each endpoint - to demonstrate that the head is heavy and needs to decelerate - but really, it's 98% there, so now I'm just being picky, picky, picky. Love it! I actually am fine with tge somewhat jerky head motion. It's closer to the look of the stop-motion work in ESB. I think it's time for dust impacts, and (at least for mama) road damage. Take a look at this old HF2U tutorial. Good hints for dust impacts and ground damage. @TriFlixFilms nice handheld motion. Your AT-AT is overlit like ZCC's early render. Recheck your control map/mask for your DoF blur. Look at the left side gate. You have the far part of the gate blurring, but the AT-AT farther away is still pin sharp. I do like the vibrance of the grade. @Triem23 thanks for the tutorial. Will check that out now.. And I think @TriFlixFilms just downloaded my earlier render from Youtube to prove his concept. And I was thinking of doing a grade similar to yours, with camera shake as well. Probably for the final version. Sometimes when I do vfx I absolutely hate my results, but as soon as I color grade and add my 'cinematic' elements it ties it all together. What I am getting at is... your project is already amazing so everything from this point forward is just taking it above and beyond. Great work! Cant wait to see it when its complete. For now I will just add sound, camera shake with each of the big walker steps, and maybe some cinematic elements. The ground impact technique listed by @Triem23 would look good, but would not be fun for this shot as there is 2 walkers. But I might make a Star Wars fan-film soon, so having this rig and animation will be great, and the things I've learned along the way will help to! @ZCC_Productions where did you get the model? @ZCC_Productions Holy crap! I was impressed with your animation before, but just downloaded the model you used and with all the parts there I am even more so. I do not know how you managed to get that thing to even lift a leg let alone make it walk. I clicked through all the parts on importing into Hitfilm and did not see anything amiss on that right rear leg either as they turned red when selected. If it was me doing, I would hazard a guess that I missed clicking on one to animate it when I imported and then it's stuck like that. I'm sure that's not the case in your instance though. My hat is off to you. @Andersen01498 ZCC says when he tries amimating the right/rear leg it pulls part of the body with it. Haven't looked at the model myself, but, based on what tddavis just wrote, it's possible ZCC made an error when parsing the animation groups? @Triem23 Nope. When I import the model, one of the highlighted red parts is the back and part of the leg. Might try re-downloading it though. Or if it works in 3Ds Max @Andersen01498 is there a way to share the model that works? @Andersen01498 is there a way I could download it?